The Gowanus Lounge: Bike Lanes #1: Does Coney Boardwalk Need Them Marked? 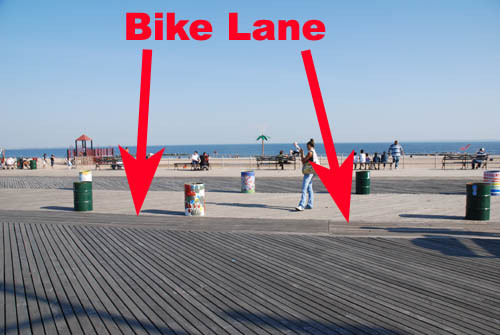 Bike Lanes #1: Does Coney Boardwalk Need Them Marked? As most people know, there's a reason for the boards in the boardwalk being laid out in two directions: vertical and diagonal. The reason that there are 2 paths with vertical boards is for TIRES. Bikes, wheelchairs, etc. When bikes roll over the diagonal boards, they rumble and probably cause some damage. When I go out biking in the morning, there are HUNDREDS of walkers just meandering down the bike lane. They can't understand why a biker is racing towards them down the vertical boards. I wish the parks department would paint "bike lane" or the image of a bicyclist on the vertical boards so these morons people will understand the difference. Other cities (Ocean City, etc) have properly designated the bike lane. I'm tired of playing "obstacle course" with old people residents. This is exactly why the proposed bike path would be a waste of time. I'll bet you that even if the bike lane on the boardwalk was painted bright yellow and had orange traffic cones lining it and every block their was a huge billboard which read "Warning: The yellow area is for bicycles and other vehicles only" and had a drawing of a stick figure on a bicycle running over another stick figure people would still walk along the bike lane. I can tell you that in the parks nothing has stopped people from walking along bike paths and horse paths no matter how clearly they are marked. On the Brooklyn Bridge half is marked for bikes and yet people just walk along that side without a care in the world. Now imagine there was a path running along the beach in front of the boardwalk. Imagine how inviting it would be for people to walk along it even though the boardwalk is only a few feet away and there is acres and acres of beach right next to it. The best thing to do is redesign the boardwalk so that bikers can use all but the very edges giving them the opportunity to steer around pedestrians. The bike paths that have always worked the best are the ones as wide as an average city street. So, we find bike lane discussion on the Coney Boardwalk. We have biked on the boardwalk and every cop on the boardwalk has emphasised that biking is not allowed at all on the boardwalk. They force you to get off your bike and walk. The boardwalk was not made for bikes they said, on top of having to many pedsetrians that you might crash into. To further my point, a few years ago a friend was biking one Saturday(obviously illegal) and his tire got caught in between the vertical slats causing him to flip over the bike and cracking his face on the wood. He has to be taken to the coney hospital for 13 stitches. The police officer and the doctor on call that we met with said this happens to frequently. The Doctor then proceeded to give him a slap on the wrist and said this is what happens when you break the rules! Actually, you can call the 60th precinct at (718)946-3311 to hear it directly from the NYPD that during certain hours, which are posted on signs on the boardwalk, bicycling is permitted. However, there is no such thing as a bike lane on the Coney Island boardwalk. http://www.coneyisland.com/cgi-bin/yabb/YaBB.cgi? website forum member "newbeacher" invented this bike lane.